The Flying Spaghetti Monster now graces my tree. 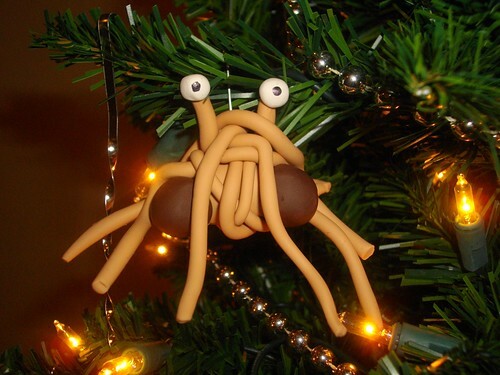 May he touch you with his noodly appendage this Holiday season. Ooh, yours is even noodlier than ours! That is so awesome… but why aren’t you using your stuffed one? @Kalev – Because the stuffed one is huge! The tree would not be able to support it. Oh… I did not realise the FSM was so noodley in his domineering! Well good that you made another idol of him to worship during Happy Consumer Gorging During Crap Weather Holiday. Last time we had a tree (we only bother if we’re actually going to be home for Christmas), it had a plush squid and a plush lymphocyte in it. This year it’ll be decorated with whatever the cats don’t wreck, in the upper branches only!